wide variety of soils and climate conditions and bloom faithfully every summer with very little attention. bloom for weeks. Many will rebloom, adding to their seasonal show. particularly good at hiding dying bulb foliage, so they are often inter-planted with spring-flowering bulbs, such as tulips and daffodils. and to the darkest red. graceful, old-fashioned form. 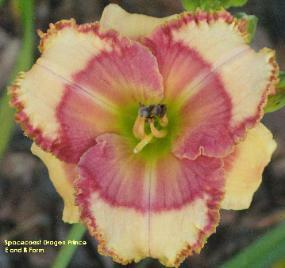 Many double-flowered daylilies are diploids. diploids. They're also supported by stronger and sturdier scapes. followed by more blooms, often right up until frost. Removing the faded flower heads encourages reblooming. “reblooms”, “extended blooms”, “green throats”, “yellow throats”, an infinite diversity. season. Rebloomers often extend into the late season too. to the soil every three years in daylily beds. This is also the time to divide the clumps. are such tough plants, that in the North, most can be planted anytime from spring through fall. 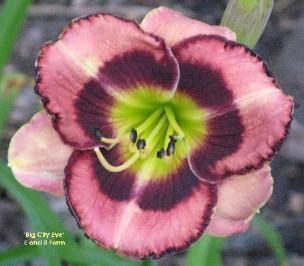 almost certainly increases the number and size of daylily blooms. daylilies. In the North, early spring is an alternate option, especially if the weather typically turns cold quickly in fall. away to friends and neighbors. Discard any small or diseased plants. How do I care for my daylilies? grooming, controlling weeds, and sanitation. renewed emphasis placed upon liquid fertilizer applications. This is the quickest acting of all. We use balanced 13-13-13 fertilizer on our daylilies but one with a higher phosphorous content is also appropriate (such as 12-18-12). Keep your garden neat and tidy. Many gardeners remove the day's blooms at the end of the day to give their gardens a pristine appearance. The most effective weed control measures for the home garden are mulching and hoeing. Proper sanitation measures lead to healthier daylilies. In the spring, dead foliage and debris should be cleared away from around your daylilies. During the growing season, damaged or diseased foliage should be removed. At the end of the bloom season, cut off the bloom scapes to within a few inches of the ground unless you are hybridizing. 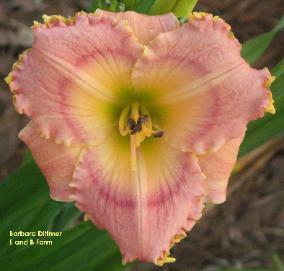 Daylilies have three serious plant pests - - - aphids in the early spring, spider mites in dry weather, and thrips during bloom season. Daylilies have their own specific aphid which feeds only on daylilies. Aphids are most active in cool weather, spring and fall in temperate zones, and all winter long in the subtropics. order to reach daylily aphids inside the fans, a pesticide with at least a mildly systemic action is needed. There are a number of good aphid killers: Malathion, Spectracide, & Diazinon are three. Do not use the pesticide Kelthane, which is known to harm daylilies. difficult for the average gardener to obtain, as an alternative, several applications of Spectricide may be necessary for mite control. The product Kelthane is NOT a desirable mitacide for daylily plants. Again, do not use the pesticide Kelthane; it is known to harm daylilies. Several species of thrips are known to infest daylilies. Control thrips by starting early in the growing season with a pesticide having either a systemic or long residual action. Thrips are controlled with Spectricide, Malathion, or Diazinon. To repeat, do not use the pesticide Kelthane. Slugs and snails feed on the young, tender tissues, causing ragged edges and holes. They feed at night and hide during the day in cool, moist places, such as in mulch, under rocks and bricks, and in dead foliage. Sanitation helps to control slugs and snails. Otherwise, control requires using pesticides which are targeted specifically at these pests. There are other pests that attack daylilies. Japanese beetles, grasshoppers, and periodical cicadas. Bulb mites may be involved in the transmittal of crown rot. Deer will sometimes eat daylily flower buds. disease, keep the area around daylilies open and airy, remove diseased foliage, and water plants when rainfall is insufficient. you need more information: www.daylilies.org/ahs_dictionary/daylily_rust.html. information, visit the AHS website.